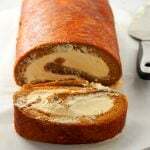 A simple yet elegant cake, coffee Swiss roll has a nice and creamy coffee whipped cream icing enclosed in a soft and light coffee flavored chiffon cake. Enjoy a slice of this cake to satisfy your coffee cravings. Originally published on June 6, 2017. Updated with photos and improved recipe. 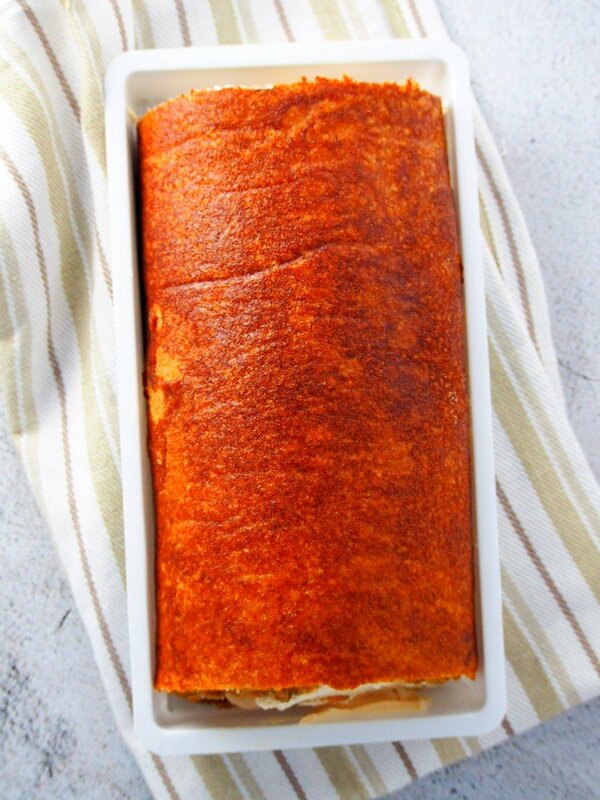 I made Coffee Swiss roll for you today. 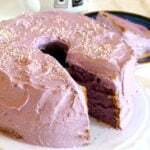 Light chiffon cake with the perfect note of coffee flavor, you are going to love this one. I enjoyed this Ovaltine cake so much that I thought it would be a great idea to make a similar cake. That is, something that has whipped cream icing too. 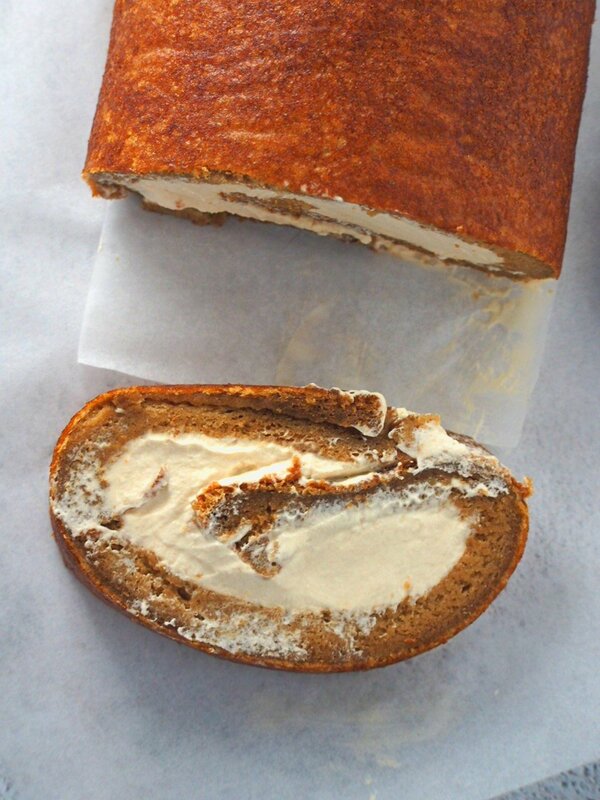 The coffee-flavored whipped cream icing intensifies the flavor of this coffee swiss roll. The airy and creamy texture that is infused with coffee flavor is almost like a soft cloud of coffee melting in your mouth. I am such a fan of cake rolls. I love how the icing peeks thru the center when they are sliced. They are so pretty on their own even without the fancy frosting on the outside. 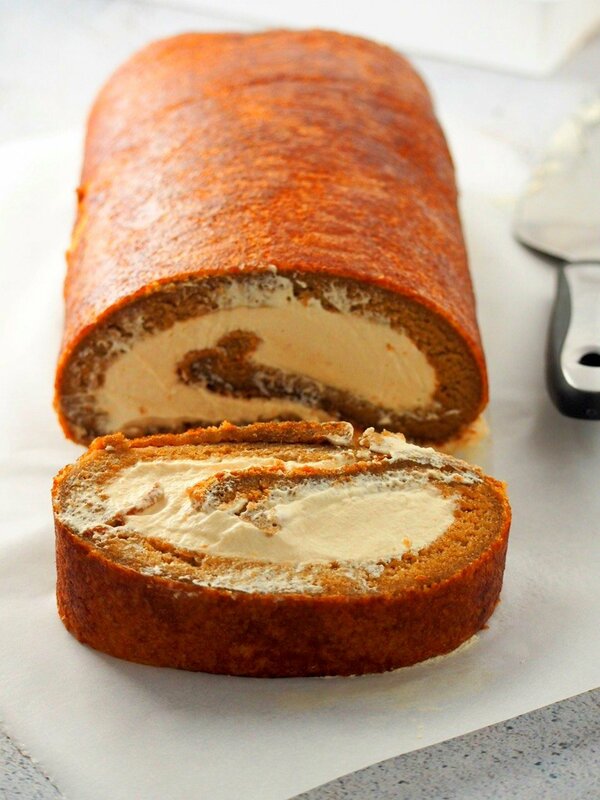 The coffee chiffon cake is a cake roll champion. It is not too thin and not too puffy so it rolls very nicely. The texture is not too delicate, yet not too dry, giving it the perfect flexibility for rolling. 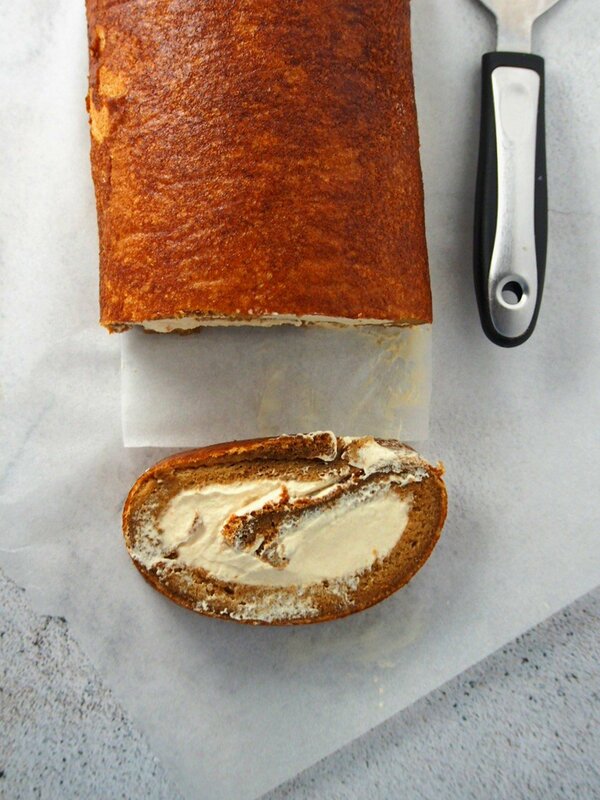 The outside texture of the roll is just what I have been dreaming of for a cake roll, smooth, even and no peeling. Thanks to the method of greasing the parchment paper! 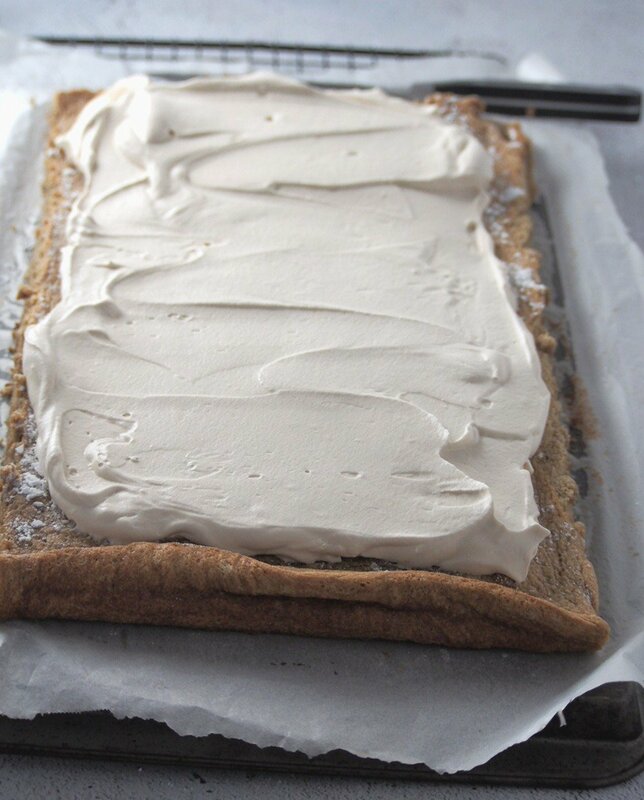 The whipped cream icing is perfectly flavored with coffee- not too strong and not too sweet. Just moderately rich and really creamy! 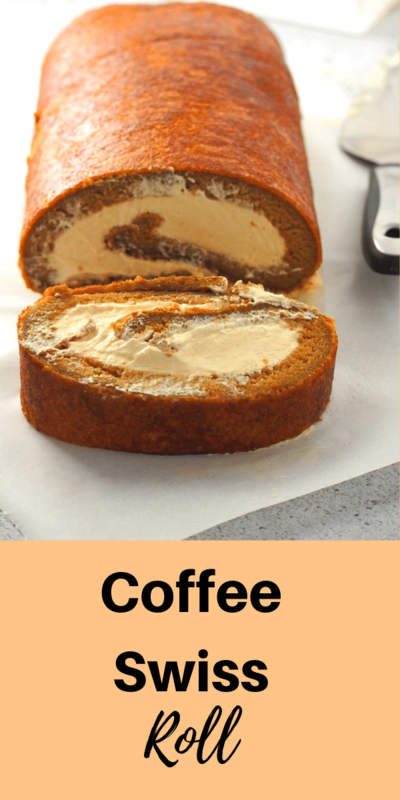 How to Make Coffee Swiss Roll? This is an important step. The cake pan needs to be prepared correctly to get that nice, unpeeled cake interior I was raving about. 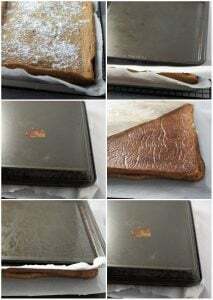 Grease a 12 x 18 inch baking pan with cooking spray. Cut a piece of parchment paper that is slightly larger than the pan. Line the baking pan with the parchment paper, easing it into the corners and letting it extend up a bit on the edges of the pan. Grease the parchment paper well with the cooking spray. 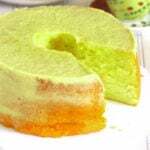 Since this is a chiffon cake, the texture is mainly derived from the beaten egg whites. The egg whites are beaten until they form firm, stiff peaks- forming a meringue. The meringue is folded into a yolk batter mixture which is made of egg yolks, oil, water, vanilla extract, coffee mixture, and the flour mixture. The two batters are mixed together by folding gently with a rubber spatula until the color is uniform. We pour this batter into the prepared cake pan and bake it at 350 F for 10-12 minutes or until a toothpick inserted at the center of the cake comes out clean. Transfer the cake with the parchment paper still attached to a wire rack. Let it cool completely. How to Roll the Cake? Now, this part may be scary for some bakers, myself included. 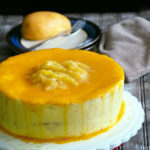 But fear not, this chiffon cake has the perfect texture and flexibility for rolling. Also, I have found my favorite method to roll cakes which I will show you below. 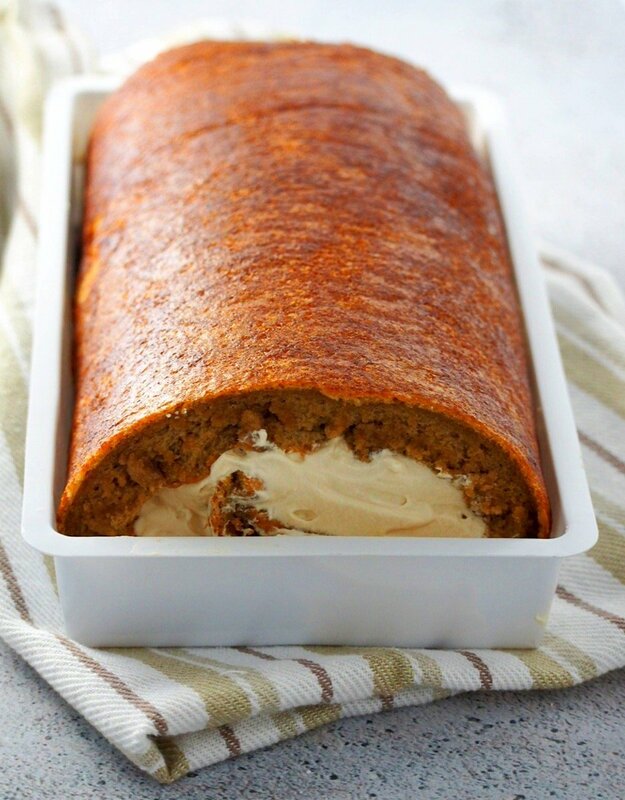 If you follow the recipe and the method, your cake rolls will always be a success. Now that the cake has cooled down on the wire rack, we need to remove first the parchment paper backing. 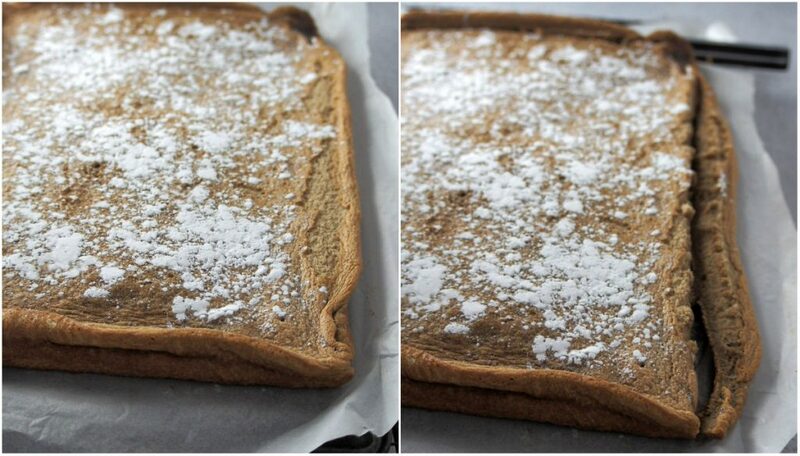 Sprinkle a generous amount of powdered sugar all over the surface of the cake. Cover the cake with a piece of parchment paper and top the cake with the same size baking pan. Turn the cake over, with the rack and all. Remove the wire rack, and gently peel off the parchment paper. Reposition the parchment paper over the cake, top it with another baking pan. Turn everything over again. Remove the pan and the parchment, the cake is right side up again. Trim just a bit of cake from the edges to make the rectangle straight and spread the whipped cream icing over the cake. Now let’s roll the cake. With the short edge close to you, lift the parchment paper and start to roll the cake over, lifting the parchment along with it. Continue to roll the cake forward until you reach the other end. Close the seams together, with the cake still inside the parchment paper. Press the cake to reinforce the shape of the roll. Transfer the cake to a cake plate. Carefully remove the parchment paper. You are done! Now all that is left to do is chill the cake before serving. Cover it with a plastic wrap well and chill for at least two hours. And now my favorite part, slicing the cake. I love slicing into the soft chiffon and reveal a fluffy, creamy whipped cream icing in the center. 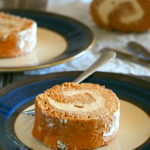 A simple yet elegant cake, coffee Swiss roll has a nice and creamy coffee whipped cream icing enclosed in a soft and light coffee flavored chiffon cake. Preheat oven to 350 F and line a 12x18 inch baking sheet with cooking spray. Line the pan with parchment paper that extends a bit up to the edges of the pan. Grease the parchment paper well with cooking spray, too. Sift together flour, 1 cup sugar, baking powder and baking soda in a bowl. Add the salt and set the mixture aside. In another bowl, stir together egg yolks, oil, water, vanilla extract and the cooled coffee mixture. Add half of the flour mixture and mix until incorporated. Add the remaining flour and stir the batter until smooth. 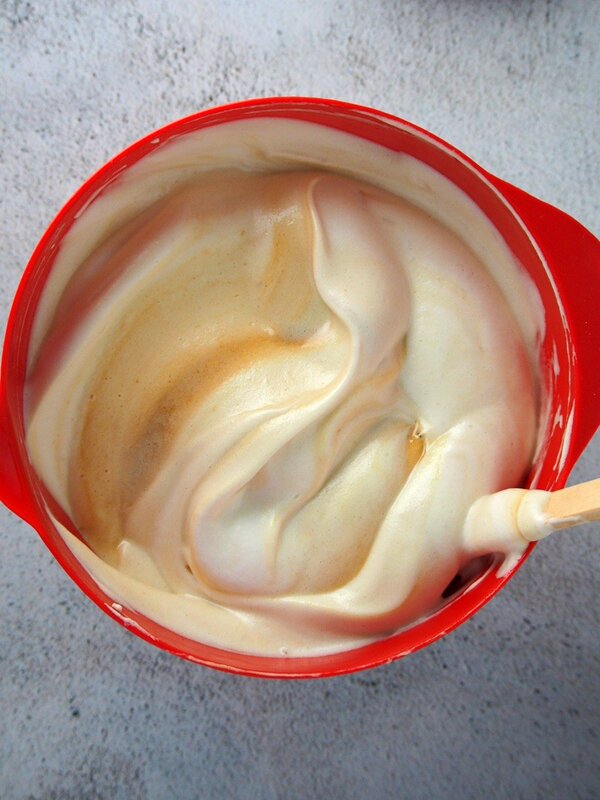 In the bowl of your stand mixer (or use a handheld mixer), whisk the egg whites until soft peaks form. Gradually add sugar while the mixer is still running and continue to beat until stiff peaks form. Using a rubber spatula, add a little amount of the egg whites to the yolk batter and stir until the mixture is smooth and has thinned down a bit. Fold the remaining egg whites to the yolk batter in three additions and stir until the color is uniform. Pour batter into the prepared baking sheet and bake at 350 F for 10-12 minutes or until a toothpick inserted in the middle of the cake comes out clean. Remove cake from the oven and transfer it with its parchment paper onto a wire rack to let it cool to room temperature. In the bowl of your stand mixer, beat together heavy cream and icing sugar until soft peaks form. Add the cooled coffee mixture and beat until the mixture is thick and fluffy. Dust the top of the cooled cake with icing sugar all over. Before rolling the cake we need to peel off the parchment paper backing that it baked on. To do this: Cover the cake with a piece of parchment paper and place another baking pan over it. Turn the cake over, with the rack and all. Remove the wire rack and gently peel off the parchment paper. Reposition the parchment paper over the cake, place another baking pan against the cake again and turn everything over once more. Remove the pan and the parchment. The cake is now facing right side up again. Spread the whipped coffee cream over the surface of the cake. Using the parchment paper that is under the cake, lift the short edge of the cake that is closest to you. Start to roll the cake as you continue to lift the parchment paper along. Roll the cake until you reach the opposite end. 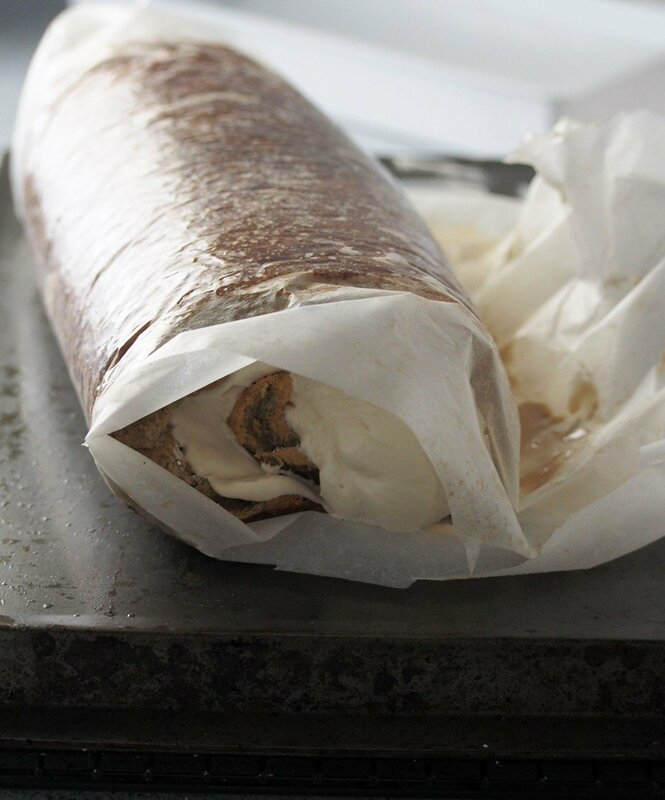 Wrap the parchment paper over it and even out the roll by shaping it with your hands. Transfer the cake to a serving plate and unwrap it. Chill before serving. I was reading the ingredients and noticed it only requires 1/2cup cake flour and 1/2 T of baking powder? I think that chiffon cakes requiring 5 eggs and that much baking powder would need more than 1/2c of flour. Hello Essie! Thank you very much for pointing that out. I have verified and retested the recipe and everything is okay. Thank you so much! I hope you enjoy this. I just saw your reply today while browsing the recipe. I should try this new method- greasing the parchment paper. I’ve been wanting to do this for my mocha chiffon roll since my youngest son is not a fan of frosting. Thanks again for sharing. Maybe next time I can attach a picture. Hi Essie! Yes, this one rolls wonderfully. This is now a new chiffon recipe and it is so much better than the previous one. Good luck and happy baking!